I hope you will forgive me for adding a game hen photo in between my blog posts about baby chickens. 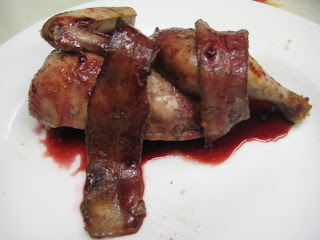 I'm testing a game hen wrapped in bacon with a blackberry and balsamic glaze. I am figuring out the best way to wrap the hens in bacon, and all the ways not to. This was my second attempt at the glaze and this one was much better. This is my failure at securing the bacon to the hen, but I'm looking forward to trying some different techniques. I'm feeling that I'll be adjusting the recipe a couple more times. I'm sorry I'm not posting my recipe tests-it would be a waste of both our times, as sometimes- they really don't work out. While I test these recipes, I'm thinking of the flavors in wine while I play a blind match game with my ideas paired with imaginary varietals. Plus, this is going to be a late spring, summer book and I 'm trying to be conscientious about barbecuing, summer fruit and of course ways to make the recipe vegetarian if it isn't already- obviously this one isn't one of them.